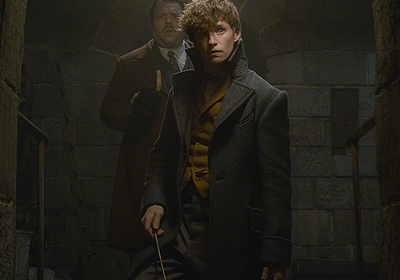 "a visual feast for the eyes and the senses, made all the more engrossing in IMAX"
Under the Direction of David Yates, who to date has directed six films in the series, comes the latest entry in the Wizarding World franchise, Fantastic Beasts: The Crimes of Grindelwald starring Eddie Redmayne as Newt Scamander who once again dazzles on screen as the reluctant hero. This time around, he is tasked by Albus Dumbledore played by the wonderful Jude Law to stop Johnny Depp’s Gellert Grindelwald from taking over the world and subjugating the muggle-born human kind. Before I get into it, I’d like to say that I am a Harry Potter fan, I’m not a die hard fan, I’ve seen all the films but haven’t read the books, but since the Fantastic Beasts series aren’t based on books by the incredible J.K. Rowling, I don’t feel that I am missing out, that being said, I do think this film does a good job at connecting the two franchises in the Wizarding World. Right from the get go, Fantastic Beasts: The Crimes of Grindelwald is a visual feast for the eyes and the senses, made all the more engrossing in IMAX, the opening is incredible, I'll keep my thoughts non-spoilery. For a film called Fantastic Beasts, there are a shortage of Fantastic Beasts, however when they are used, they are utilised extremely well, and have sequences that stand out, especially the sequence with the Matagot Cats and the Zouwu as well as every time that the Niffler and Baby Nifflers show up, they are really cute. A criticism I have is that the main four that we were introduced to in Fantastic Beasts and Where to Find Them; Newt (Redmayne), Tina (Katherine Waterston), Queenie (Alison Sudol) and Jacob (Dan Fogler), who fit their roles wonderfully, aren’t together as much as I would have liked but in the context of the film it makes sense, when they are together it is great however I do hope that they spend more time as a unit in the future, and where they end up gives me hope that they'll be together more. Fantastic Beasts: The Crimes of Grindelwald expands on the universe with the introduction of the new characters; Callum Turner as Theseus Scamander, Claudia Kim as Nagini, William Nadylam as Yusuf Kama and Zoë Kravitz as Leta Lestrange is great, however Kravitz is underused, but when she is used she is used well. Leta and Theseus were referenced in the first film, but this is the first we see of them, and both characters are great and have integral arcs in the film. As we know this is film two in a series of five, so we know there is a sequel coming, the Fantastic Beasts franchise is different to the Harry Potter series but with a strong second film in the series I look forward to the future of the franchise. All in all Fantastic Beasts: The Crimes of Grindelwald is a magical entry into the Wizarding World franchise, going back to Hogwarts was a treat and the music accompanying the film from James Newton Howard is incredible and strengthens the spectacle without distracting from it, there are definite hints to John Williams' incredible score but it is definitely its own.